1962 : les meilleurs films de l'année. Steve Judd: That boy you trained personally shows a substantial lack of judgment. Steve Judd: Well, I'm not payin' him ten dollars a day to go moonin' after some girl whose old man is about to hind-end him with a load of buckshot. 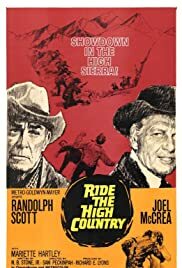 An above average Western featuring two of the genres most recognizable stars, Joel McCrea and Randolph Scott (in his last film). Both men have a history together as outlaws, but McCrea has gone straight and is now in charge of getting the gold from the mines to the bank. To help him, he hires his old friend Scott who, along with a young hothead (Ron Starr), is in town dressed up like "Buffalo Bill" and demonstrating his fancy shooting. Scott believes he can persuade his old partner to split the gold with him before they return, and must act as a buffer between the impatient young ruffian and his old friend. While en route, the three encounter a religious farmer (R. G. Armstrong) and his under socialized daughter (Mariette Hartley), who steals away to join them. The trouble really begins when they get to the remote mining town, encountering an inbred mountain family of hoodlums (which includes Warren Oates) and its judge (Edgar Buchanan). Directed by Sam Peckinpah, and written by N.B. Stone Jr., it was added to the National Film Registry in 1992.